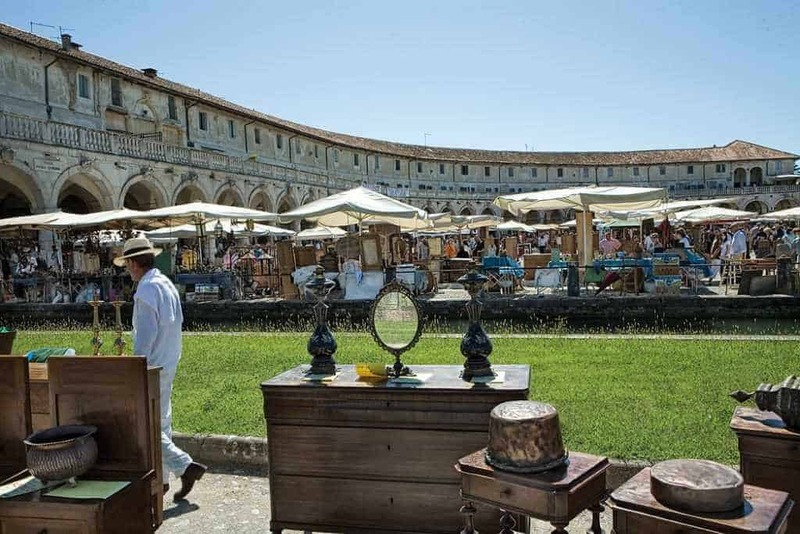 11 Summer Flea Markets And Antique Shows You Should Visit In Europe 4.5 out of 5 based on 6 ratings. 6 user reviews. 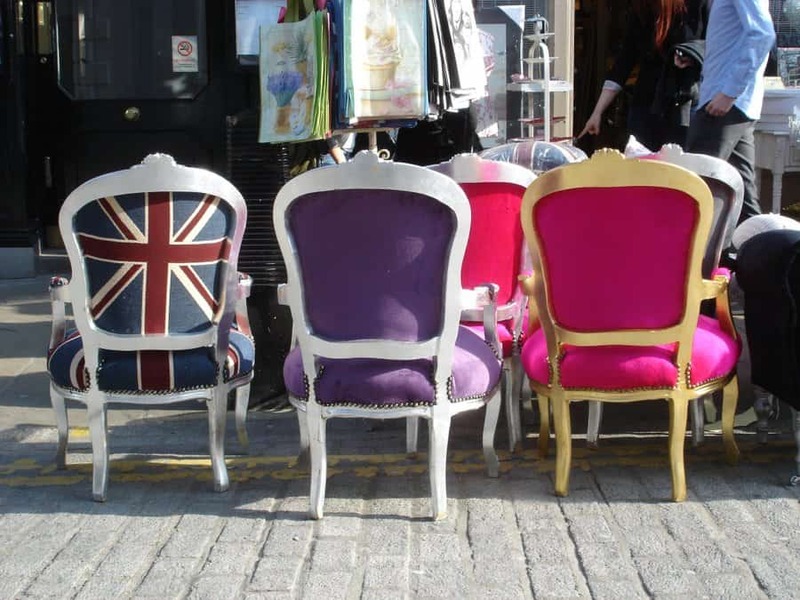 European summer flea markets often emanate a unique, inspiring vibe. In summer, European flea markets have the light-hearted atmosphere of a summer festival, but also provide a unique look into the history and society of the place where the market is held. 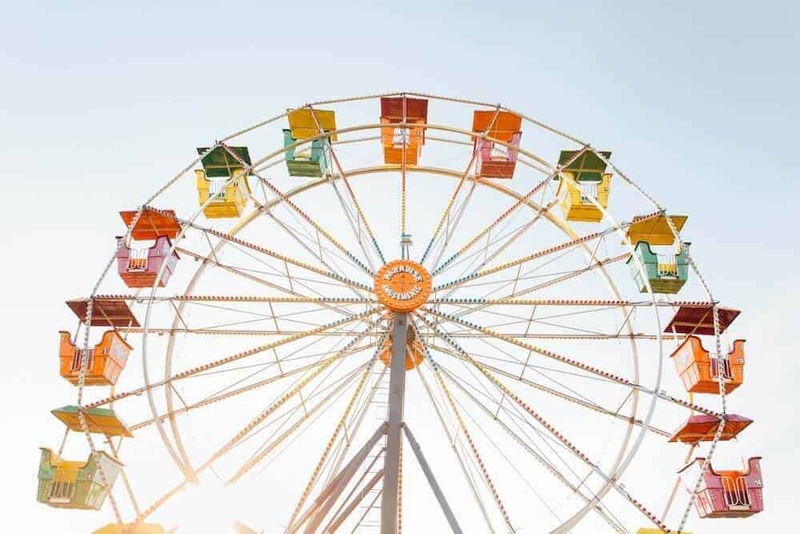 While some of the weekly flea markets in Europe may slow down a little during August, additional flea market extravaganzas and antique fairs, happening only once or twice a year, are popping up. 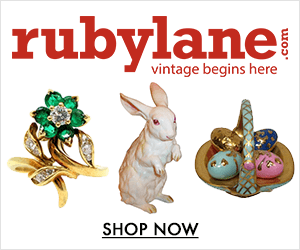 These exciting occasions sometimes gather an incredible number of vendors at the fairgrounds, selling show-stopping European antiques and other curiosities. We’ve tapped into our flea market expertise to put together a list of the best flea markets in Europe to visit this summer. Brugge Zandfeesten is one of the largest antiques and second-hand market in Flanders, and attracts hundreds of vendors, and thousand of bargain-hunters from Belgium and its neighboring countries. The event only takes place on three Sundays a year during the warm summer months of July and August, as well as in late September. The overall venue holding the Zandfeesten spreads over 3 miles (5 km), from Het Zand, to Beursplein and the adjacent Koning Albertpark. Because it is exclusively taking place three days a year, Brugge Zandfeesten turns Bruges into a shopping destination like no other in Belgium. Since 1935, the Balon del Sabato has offered a cornucopia of antiques, second-hand merchandise, footwear, clothes, house wares, toys and food from across Italy and around the world. This sprawling flea market and its 1,000 merchants and 700 street vendors is Europe’s largest open-air market and a commercial hub which attracts every week to Turin a crowd of browsers, collectors, and tourists who walk around the most diverse objects. 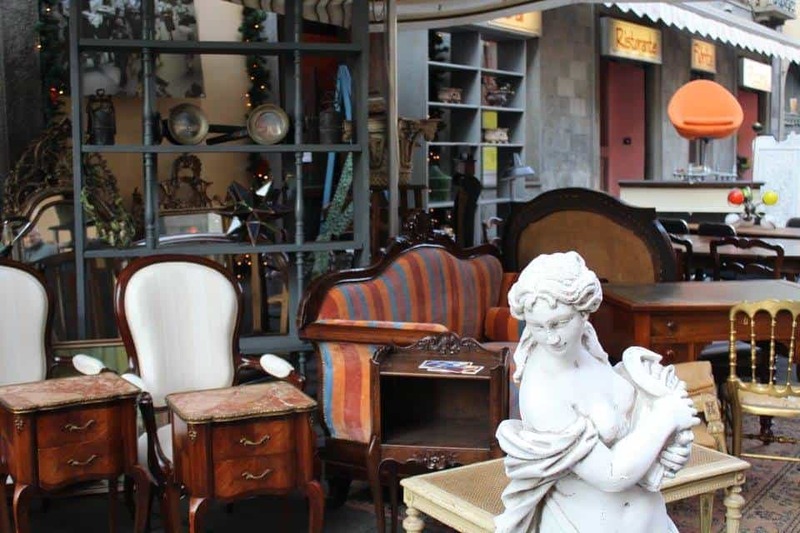 However, once a month, the surrounding streets of Porta Palazzo get packed with antique dealers’ shops, which display the very best antiques they have to offer for the Gran Balon, a true flea market extravaganza, that makes a visit to this noisy and inspiring market even more interesting. In the warm months of spring and summer, Copenhagen transforms into one of Europe’s best spots to shop for vintage. 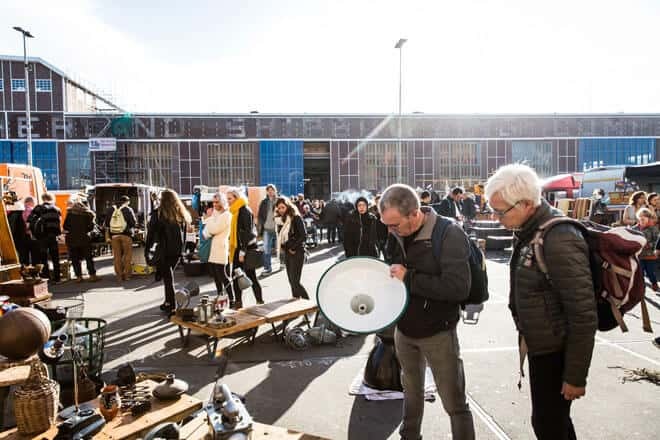 There are several interesting flea markets in Copenhagen – one of them is the weekly Frederiksberg Loppetorv which is held from early April to mid-October. Frederiksberg Loppetorv is one of the largest and busiest flea markets in Copenhagen, held in a parking space next to the Frederiksberg City Hall. Enjoy a Danish hotdog and a pint of “Gammel Dansk” bitters while you take a stroll around the market. 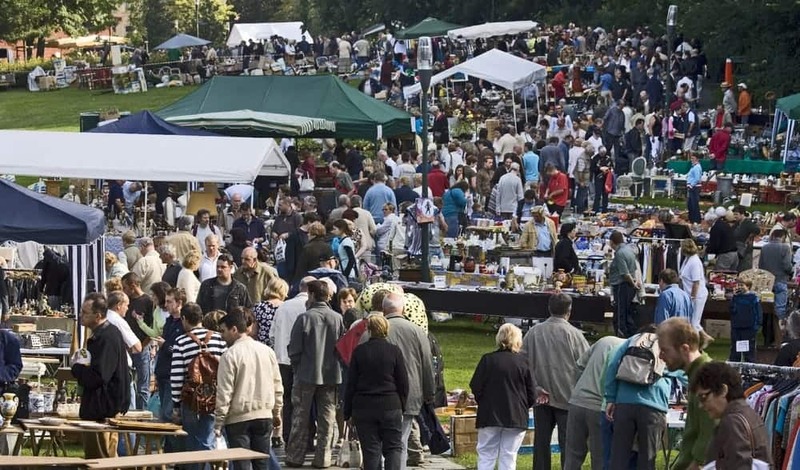 Frederiksberg flea market features over 90 stalls which offer almost everything you can wish for, especially Danish fashion and second-hand clothes, antique furniture, antique crockery, Danish design decor items, design lamps, ceramics and more. Due to the upscale nature of the neighborhood, items sold at Frederiksberg Loppetorv flea market tend to be of high quality, making it a good bet to find great and useful stuff at reasonable prices. 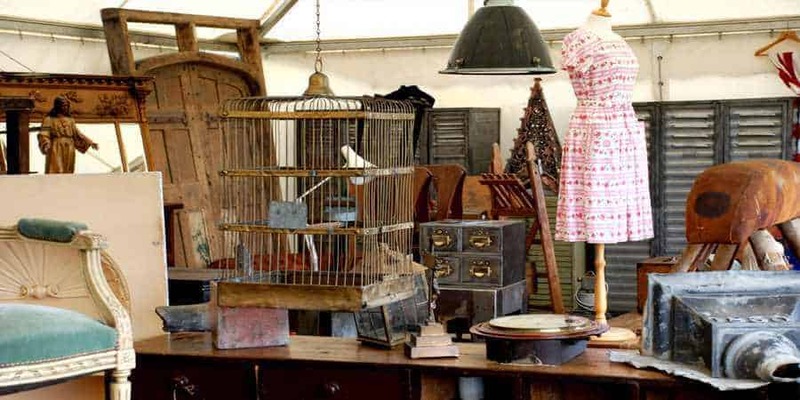 Featuring over 1,700 stallholders offering a great selection of goods ranging from fine antique furniture to delicate ceramics, the Ardingly International Antiques and Collectors Fair has a reputation as one of the UK antique fairs where quality European decorative items can be found. Because it is located only one hour away from London, the Ardingly International Antiques & Collectors Fair is a truly cosmopolitan antique event, and a hot spot for local and international dealers and buyers, who come from as far as continental Europe, Asia and North America to look for unusual bits of furniture or quirky accent pieces. With a combination of inside and outdoor stands, this mid-week fair is the perfect opportunity to indulge in a little vintage shopping or hours of professional trading this summer. One of the largest flea market and antique fairs in Belgium, Ciney Puces et Salon des Antiquaires showcases more than 700 exhibitors from Belgium, France, Germany, Holland or even Italy. The Ciney Expo Antique Fair is held twice a year over three days and welcomes over 15,000 visitors. Ciney Puces et Salon des Antiquaires is famous because of its unique concept of unpacking at the back of the truck: on the first day of the fair, over 500 trucks gather on Ciney Expo’s car park. At 2 pm sharp, the gates of Ciney Exp open to visitors, who then rush as fast as possible to the trucks in search of rare and unusual objects. This is really the must of the fair! One of Europe’s largest monthly indoor flea market, Amsterdam’s Vlooienmarkt IJ-Hallen is a sprawling market, taking place mainly inside two massive former industrial shipyards. The indoor market is protected from Amsterdam’s unpredictable rain showers and visitors can, therefore, be certain to have an enjoyable day of vintage shopping ahead. In the warm season, however, the number of vendors grows from 500 to 750 vendors, most of them setting up their stalls in the outdoor area between the former shipyards. The IJ-Hallen flea market is a prime destination for die-hard second-hand shoppers from all over Europe and beyond. The vendors at IJ-Hallen sell antiques, vintage furniture and home decor, vintage fashion, interior design, jewellery, books, vintage pull-down charts, kitchenalia, and just about anything else you can think of. Prague is a magnet for tourists from all over the world, boasting one of Europe’s most beautiful historic city centers. However, the narrow cobblestone alleys can sometimes feel overcrowded and that is when it is time to head out to Bleší Trhy Praha (Vysočany). A visit of the largest flea market in the Czech Republic, formerly known as the Kolbenova flea market, will take you off the beaten track, with the potential to find hidden treasures at this weekly market. The flea market takes place every weekend in Prague’s Vysočany district and can be easily reached within 20 minutes via public transportation – yellow underground line “B” until “Hloubětín” or just as fast with either tramway line n° 8 or n° 25 until “U Elektry”. To adjust to the setting and atmosphere of the market, we recommend to take the tramway and watch the scenery deteriorate as the destination comes closer. 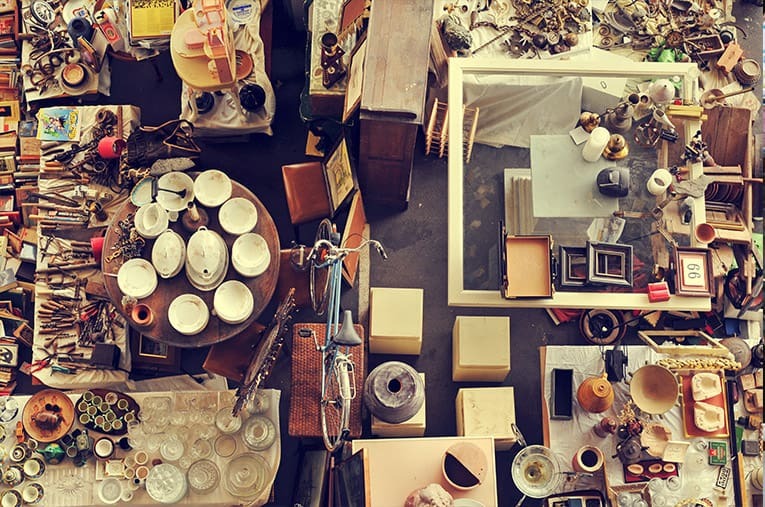 Do not expect a well-curated antique market when visiting Bleší Trhy Praha – this is a flea market for shoppers that are willing to get their hands dirty to uncover treasures. The market is huge, and its 650 vendors sell everything you could possibly imagine – from used electronics to vintage clothing, historic artifacts and antique furniture. 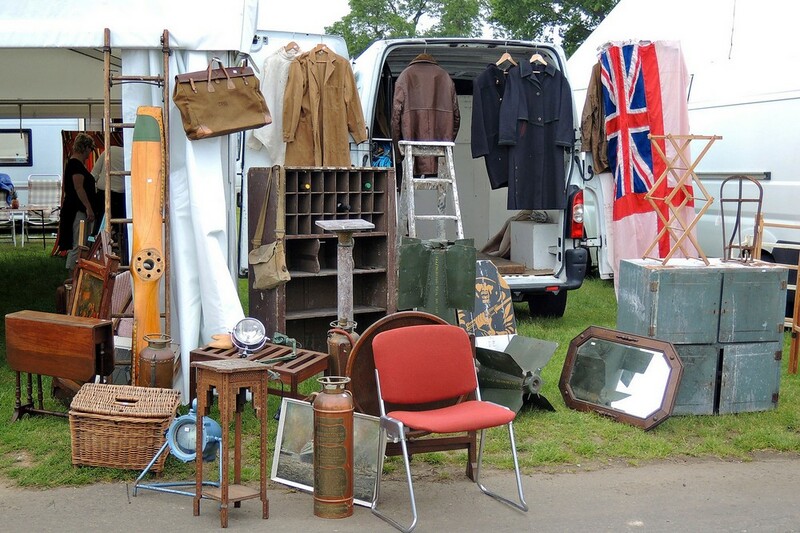 Since its establishment in 1995, the bi-monthly Lincolnshire International Antiques and Home Show has grown to become one of the largest antique markets in Europe, and a true antiquing extravaganza featuring thousands of antique vendors over 200 acres of land. Besides antiques and vintage enthusiasts, the Lincolnshire International Antiques and Home Show attracts collectors, interior designers, landscape designers, props buyers from production companies, designers, as well as thousands of shoppers from around the world who travel to the English East Midlands in order to attend this amazing show. The Flohmarkt am Mauerpark in Berlin, between Wedding and Prenzlauer Berg, is one of Germany’s most famous weekly flea markets. Every Sunday around 500 vendors gather in the Mauerpark – an area once known as the death strip (“Todesstreifen”) along the Berlin wall that separated East from West Germany. Nowadays, the area has been completely transformed and the park is an important recreational area for the busy population of Berlin, seeking to spend some time surrounded by nature. Mauerpark flea market is a huge flea market, covering around 7000 square meters, where both professional vendors and private individuals can sell their items. Up to 30,000 visitors flock to the Mauerpark Flea Market each week, rain or shine. A Sunday at Mauerpark Flohmarkt is the perfect way to immerse yourself into Berlin’s hipster scene. The quality of merchandise sold at the market varies – there are treasures to be found among the trash and, given the size of the market, you can be pretty sure that you will take home something interesting almost every time. From musical instruments and vintage vinyl to old furniture, second-hand clothing, vintage jewelry, toys and crockery – the Mauerpark Flohmarkt has it all. While you are there, be sure to sample the great street food vendors and check out the concerts taking place in the park. 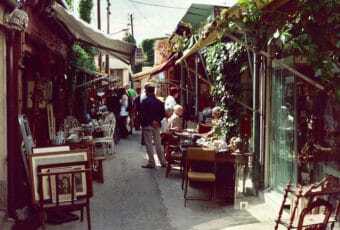 In business since 1966, the International Fair for Art and Antiques of Isle-sur-la-Sorgue in the department of Vaucluse, is one of the largest antiques and second-hand fair in Europe and a potential goldmine for antique dealers. 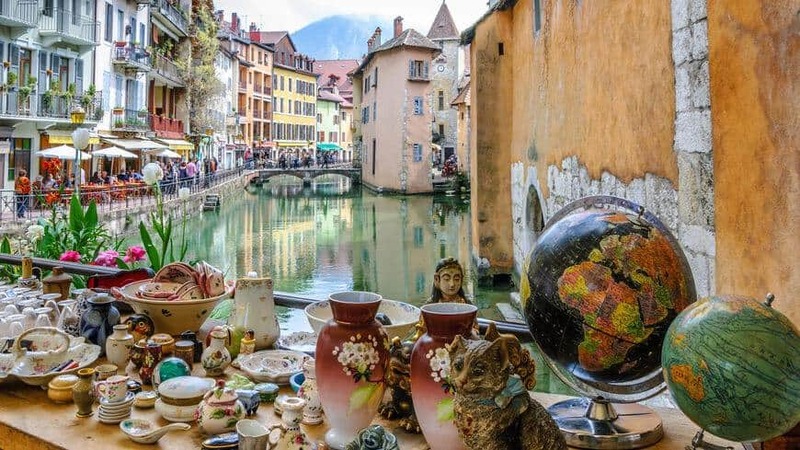 Twice a year on the Easter Weekend and on the weekend of the 15th of August, around 120,000 visitors flock to the quaint Provençal town of Isle-sur-la-Sorgue to rummage through the stalls of over 450 exhibitors (+ the town’s 300 permanent antique dealers and second-hand shops), searching for antique furniture, old crockery, and other collectibles from the south of France. Once a year on the third weekend of August, the tiny village of Temploux in Belgium and its 2,000 souls, swells under the influx of over 130,000 visitors. 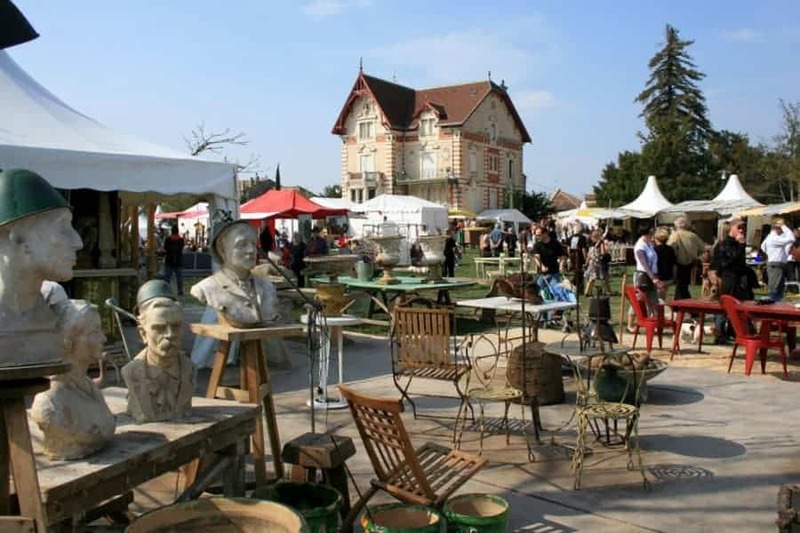 Featuring more than 1,100 antique dealers and flea market vendors spread over 4 miles, the Temploux flea market is one of the largest antique fairs in western Europe and a phenomenon in itself. It operates nonstop from Saturday morning to Sunday evening, and strictly showcases vendors who sell real antiques and vintage items. 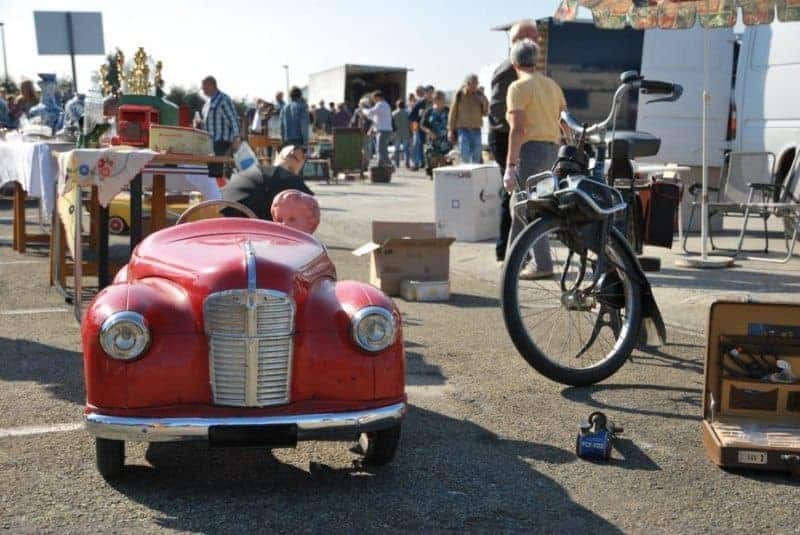 This is probably one of the reasons why Temploux has become over time, one of the most acclaimed flea market events in Belgium and in Europe. What to do when summer is almost over? 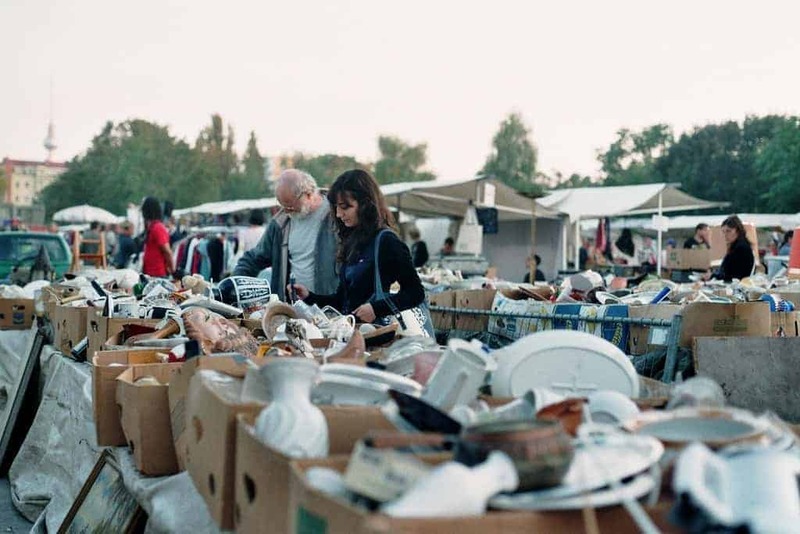 The end of summer is marked by two extraordinary flea market events in France. 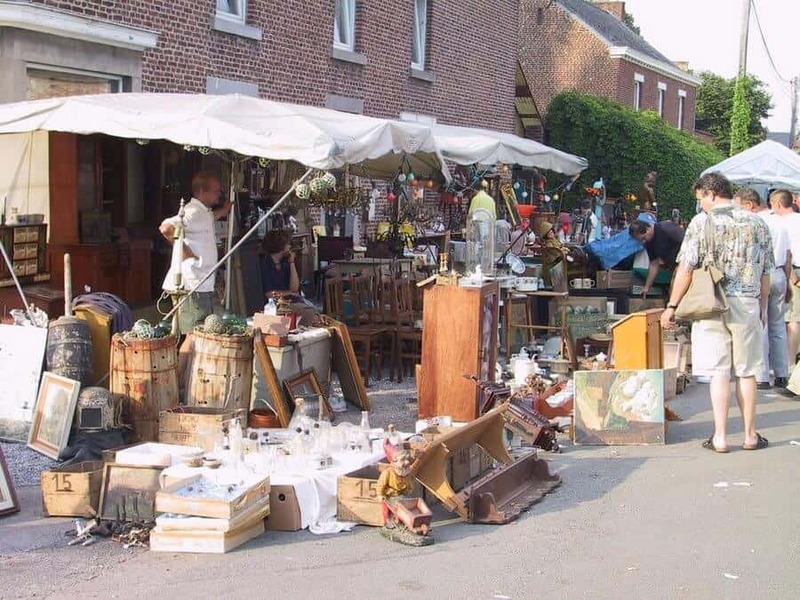 On the first weekend of September, vintage and antiques shoppers flock to two of the largest French brocantes, each taking place only once a year: The legendary Grande Braderie de Lille, and the slightly smaller, but just as interesting Bric-à-Brac de Marsac. Featuring over 10,000 exhibitors hawking their wares with everything from knick-knacks to treasures, the Grande Braderie de Lille is the largest flea market in Europe and one of the most famous events in France and beyond its borders. 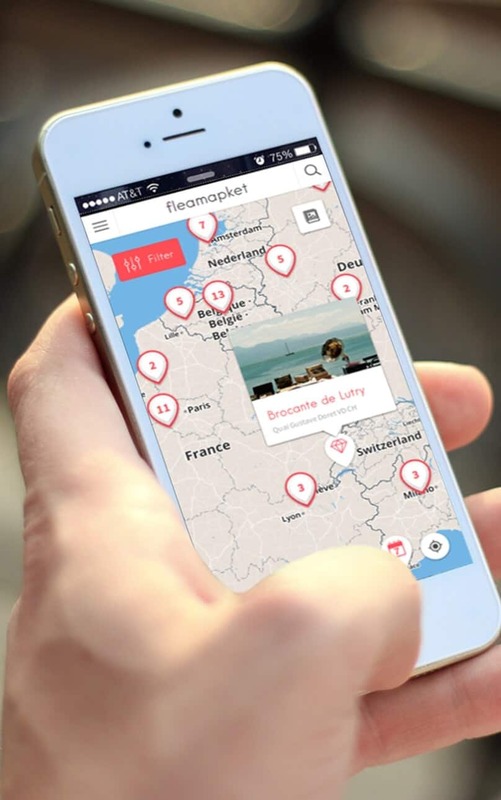 Bonus: Europe’s flea markets on a map!